Clear eyes, full hearts, maybe it can work this time. As expected, the city council vote in Ottawa to approve upgrades to Frank Clair Stadium passed on Wednesday — by a football score of 21-3, appropriately enough — to clear the way for the CFL's return to Canada's capital in 2014. It means pro football will come back to Ottawa one year earlier than expected, which sounds impressive on the surface. It's the first time a concrete, "we're on track" firm start date has been thrown down, even though plans say the south-side stand won't be done until June 2014, right on the cusp of the season. Nothing could go wrong there, eh Winnipeg? The long and short of it, speaking as a three-down devotee and national capital region resident, is it's hard to shake the feeling the CFL is more enthusiastic to have Ottawa back than Ottawa is to have the CFL back, at least for the the moment. Or that the fever is more media-generated than genuine, even with the league willing to pull out all the stops by holding a Grey Cup in the city as soon as 2018. There have been so many false starts and bum steers since the Ottawa Renegades folded in 2006, plus Eastern Ontario folks tend to be cautious by nature in this government town. That could by why, instead of a buzz, there's more of "hey, we're getting the CFL again" vibe. It's not a rah-rah city. The reason it seems more than likely to work this time is the CFL is in a better place than it was during the 1980s and '90s, when the Rough Riders were in an extended death spiral. The locals who fixate on the city having had two teams fold in the span of a decade forget that the CFL was a messed-up league for a good quarter-century, when almost every team had either a cash crunch or an ownership crisis. A better TV deal with TSN and RDS, which make their properties tent-pole events, has increased the league's profile and prestige. Better sponsorships also mean teams are less dependent on gate revenue. The Canadian talent is also more plentiful. The Jeff Hunt-led ownership group will also not have aura of being fly-by-nighters, unlike past owners (Bernie and Lonnie Glieberman, Horn Chen) who are still evoked as a punch line. On the player personnel side, having head scout Rick Worman already in place and possibly being able to stock up on Canadian talent by taking part in the 2013 Canadian College Draft means the team could also hit the ground running. That said, the Ottawa R-somethings will probably have a short grace period and need to be competitive by their second season. That all comes back to whether commissioner Mark Cohon and the eight established franchises deliver on generous terms for stocking the roster, particularly at quarterback and with Canadian talent, which will be more diluted with another 20 or so jobs alloted to a smaller labour pool. It won't be easy, but it's doable. 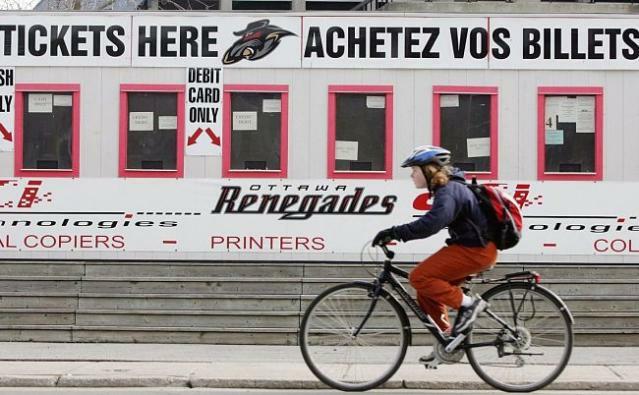 There doesn't seem to be a great groundswell that justifies Ottawa breaking out of a one-sport mentality and embracing the CFL, Double-A baseball and professional soccer, all of which could launch shortly in the city. It's not like the enthusiasm that surrounded Ottawa's bid for a NHL franchise in the late 1980s. That might say less about Hunt and Co.'s CFL endeavour than it does about the populace. They might just need time to realize this is something tangible, not just a nostalgia trip. Attempting to reprise the days when Tony Gabriel went out for a long one from Tommy Clements is no longer some blue-sky idea. It's not clear what the Ottawa CFL Team 3.0 will be, but it's coming and people in Eastern Ontario and Western Quebec have roughly 18 months to decide how to vote with their feet. Neate Sager is a writer for Yahoo! Canada Sports. Contact him at neatesager@yahoo.ca and follow him on Twitter @neatebuzzthenet.